For inquiries about using the VCL and collaborating with our faculty or graduate students, please contact us at bioarch@umass.edu or the laboratory manager, Priscilla Mollard, at pmollard@anthro.umass.edu. For further inquires or questions regarding our Taphonomic Research Facility (TRF), please contact the TRF laboratory manager, Adam Netzer Zimmer at azimmer@anthro.umass.edu. As a part of the VCL, we provide masceration services for the UMass community and larger western Massachusetts area. 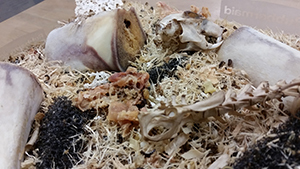 All organic specimens are processed by our dermestid beetle colony, The beetles ingest soft tissue remains on skeletal material, in order to enable clear analysis of skeletal materials. Please note that we are unable to provide wet rot services at this time. As such, we cannot process any specimens that have been exposed to preservatives and chemicals. Such chemicals will kill the beetles. The goal of our open-access journal, Landscapes of Violence (LoV), is to provide a balanced approach to the causes of violence and offer a voice for the human experience behind it. This journal deals with the interrelationships between society and violence seen through the analytical eyes of trans-disciplinary researchers. For more information about Landscapes of Violence please visit Our Journal or contact us at lov@sbs.umass.edu.